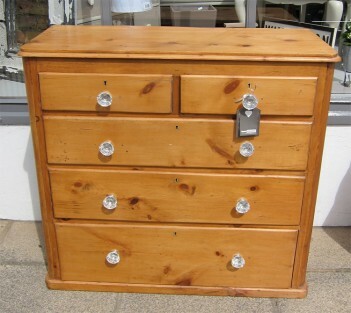 This is a Victorian pine chest of drawers. We have full restored and repolished this piece. We added the new glass handles, as the handles it came to us with were not the originals. The chest of drawers has nice proportions, tall, not too deep with large useful drawers. This piece does show signs of age, as one would expect. Please click on the thumbnail images to see larger photos.